What Is Clonex Root Maximizer? The Clonex brand is the world leader in plant propagation, and has been for nearly 30 years. Clonex Root Maximizer is the newest addition to the Clonex propagation product line. 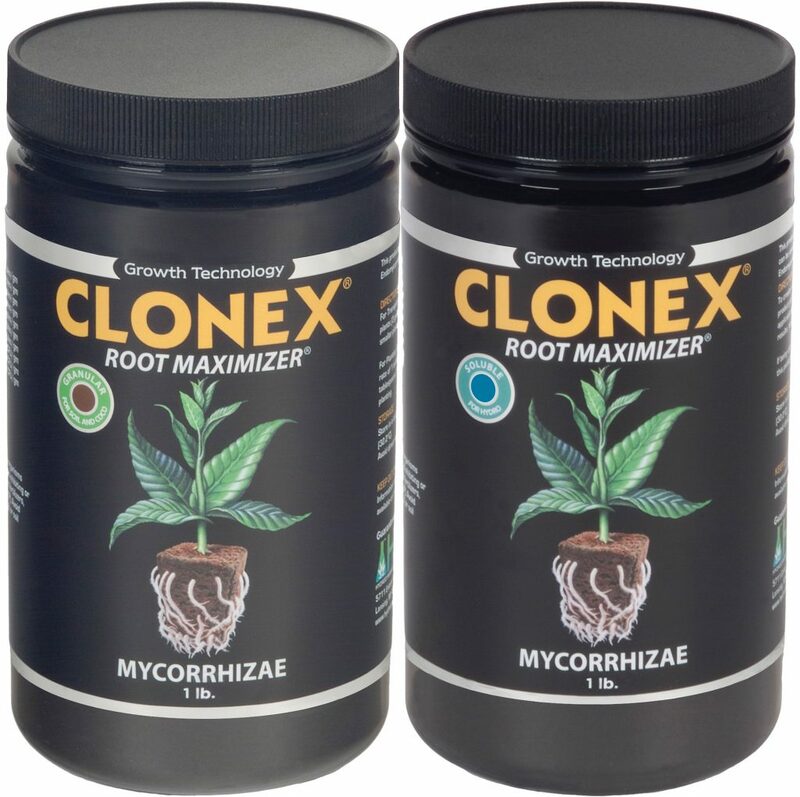 Clonex Root Maximizer is a mycorrhizae product that’s ideal for use on young plants. Over the course of the plant’s growth cycle the mycorrhizae will aid in helping the plant reach its genetic potential. For the grower, this means potential for a better-quality plant that produces higher yields. Mycorrhizae is a beneficial root fungus that aids plant roots in absorbing minerals and water from soil. There are various forms of mycorrhizae, but only one works with the majority of plants. In this case Clonex Root Maximizer consists of Endomycorrhizae, which is that one. Not every mycorrhizae product on the market is the same. As a matter of fact, most differ in the types of mycorrhizae they contain, and how the mycorrhizae were grown. These factors will impact how the mycorrhizae affects plants growth. Clonex Root Maximizer contains Endomycorrhizae and Arbuscular mycorrhizae, which are known for being beneficial to the majority of plants. Competing products contain Ectomycorrhizae, which is specifically beneficial to pine, oak, and birch trees. So, if you’re growing fir trees then yes, you’ll want to use an Ectomycorrhizae. For the rest of growers out there, this won’t help. Growers should also factor in the way a products mycorrhizae are grown. The mycorrhizae in Clonex were created “in-vivo”, which means they were created on living roots in a soil-like medium with natural organisms. But, competing products contain mycorrhizae that was created “in-vitro”, which means they were created in test tubes or petri dishes and are typically grown in inert medium’s like Oil-Dri or kitty litter. Finally, the Clonex mycorrhizae product includes beneficial bacteria and Trichoderma. Trichoderma is compatible with mycorrhizae and provides additional benefits to the overall health of plants. Unlike the competition which typically includes additional organisms like Ectomycorrhizal fungi, which doesn’t contribute to the overall health of most plants. 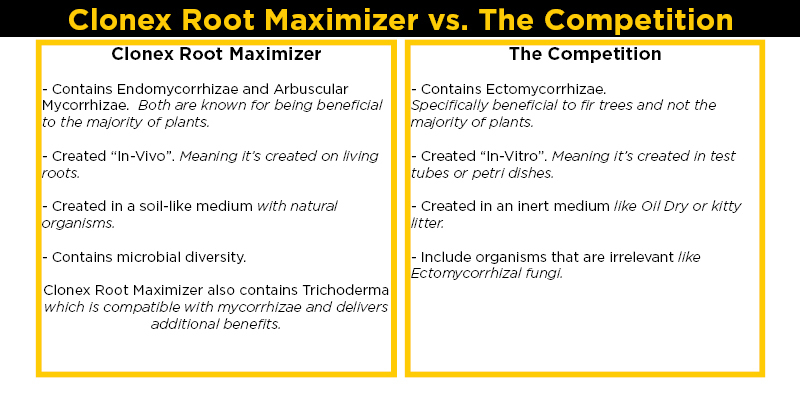 The guidelines for using Clonex Root Maximizer are the same for using any mycorrhizae product. One item to pay special attention to is the type of fertilizer you use in conjunction with it. Fertilizers with a high Phosphorus content can suppress Mycorrhizae. When using mycorrhizae, it may be ideal to consider using an organic fertilizer that will not hinder its effectiveness. Based on your growing medium you will want to use either the granular or soluble formula. Granular is ideal for soil or soilless mediums. Simply sprinkle the Clonex Root Maximizer directly onto the plant roots, or add it directly into the soil where it will come directly into contact with the transplants roots. Soluble is ideal for hydroponic application. The soluble version is technically suspendable, not soluble, so expect to see the product within your liquid as it will not dissolve. What Is the Clonex Root Maximizer Difference? The Clonex brand has provided explosive root development for serious growers and plant nurseries for almost thirty years. Clonex Root Maximizer is no exception and aids in providing both short and long-term benefits to young plants. Furthermore, treating your young plants with Clonex Root Maximizer will give them the head start needed to reach their genetic potential leading to better plant quality and higher yields.